To celebrate chocolate’s global influence on our American culture, a story of connection that brings people together, spanning time and place, AMERICAN HERITAGE® Chocolate invites you to try their Chocolate and Balsamic Glazed Roasted Vegetables Recipe. The brand’s unique flavor profile makes it a joy to explore new ideas! Like the complexity of a fine wine, a bite of AMERICAN HERITAGE® Chocolate reveals layers of taste. That should be no surprise. The mildly spicy and slightly sweet recipe is flavoured with a blend of 11 spices and ingredients available during the 18th century that range from the heat of chili peppers, to the warmth of vanilla, to the freshness of orange peel. Yield: 6 Servings, as a side dish. 1. Pre-heat oven to 425F. Peel and cube the carrots, beets, and sweet potato into a 1 inch dice. Place on a large sheet tray (or two smaller trays) in a single layer, and season with the salt and olive oil, tossing to coat. Place in the pre-heated oven and roast for 25 to 35 minutes, being sure to turn the vegetables with a spatula every fifteen minutes. While the vegetables roast, prepare the glaze. 2. In a medium pot, over medium-high heat, add the balsamic vinegar. Bring to a boil, and then reduce heat to medium. Simmer, uncovered, until half of the vinegar has evaporated, leaving about ⅓ cup of vinegar reduction. Using a whisk, add the chocolate, whisking constantly until melted. Remove from heat and set aside. 3. Once the vegetables are roasted, drizzle the balsamic-chocolate glaze over the vegetables, toss to coat, and serve immediately. I love the idea of adding chocolate to the recipe. 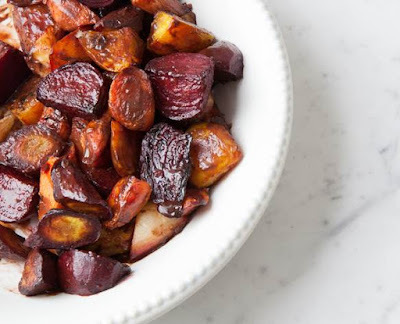 With the balsamic vinegar it should add more flavor to the roasted vegetables.